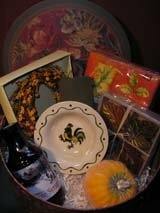 Fiddlehead Antiques offers specialty seasonal gift baskets designed to reflect individual styles! Personalized gift baskets feature vintage items, along with gourmet foods or bath products, for a woman, or a unique gift idea for a man. Selecting one of our customized gift baskets will put a stop to endless hours searching for unique holiday gift ideas. Let Fiddlehead Baskets create a personalized gift basket with vintage charm for you today. Our custom corporate gift baskets offer the perfect sloution to business/client gift giving. Let Fiddlehead Baskets take care of all the details of arranging for a business thank you gift. We are full of new ideas everyday for special occasion gift, house-warming gifts, anniversary gifts and for all occasions. We are thrilled to share our collection of distinctive wares, and incorporate them into customized gift baskets. Our "baskets" are often unique and vintage receptacles that have beauty and function! In the past I sent expensive gourmet food gift baskets, sight unseen, from well-known gift basket companies, until one honest relative confided they were not worth the postage! Items were not how they appeared in photos, or were miniature versions. 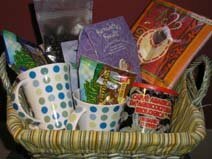 That's when we had the idea to create unique gift baskets, many with vintage items and all with delicious, high quality foods, coffee, bath products, house wares, ceramics, and books that will delight the recipient. You will find detailed descriptions of each personalized gift basket so you will know exactly what's included! Or you might like to tell us a little about the recipient and have us customize a basket for a unique personalized gift. This is your opportunity to order a specialty seasonal gift basket with hand selected items and products that will charm the receiver with their individual style and vintage flair.